Check out Sonya Hartnett’s new website on http://www.sonyahartnett.com.au/ which contains not only information about this brilliant author and her works, but also interviews with Sonya as well as teacher’s notes for several of her books! Sonya Hartnett was presented with the 2008 Astrid Lindgren Memorial Award. Does the pile of summer books begin to end? In need for a book recommendation? 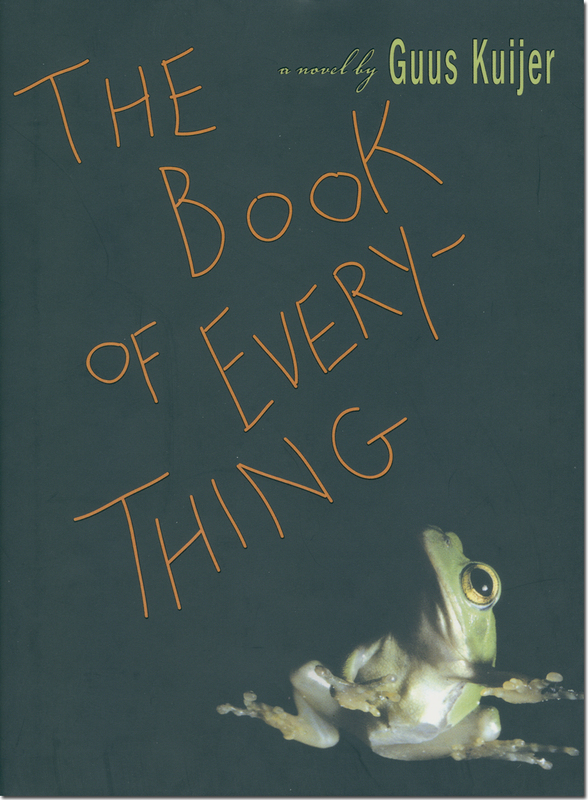 We strongly recommend The Book of Everything by this year’s award recipient, Guus Kuijer. For inspiration, we suggest reading blogger Iris on Books review on this book, or eleven year old Aria Norri’s review of the play (based on the book), here. 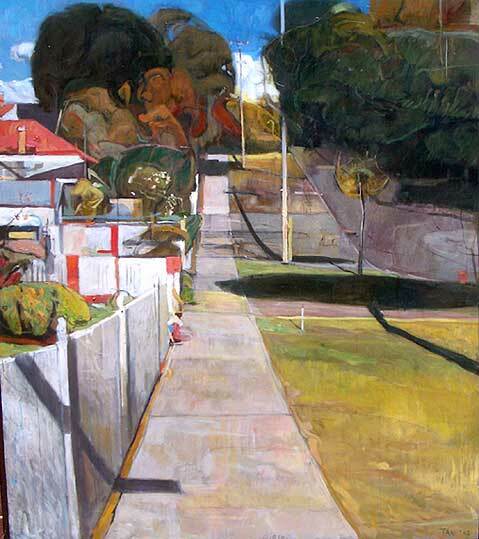 ‘Footpath, Fifth Avenue’ 2004, oil on canvas, 110 x 120 cm. Listen to Michael Cathcart’s interview with Shaun Tan in Australien National Radion, from May 15th, here. Suburban Odyssey is exhibited until July 15th. 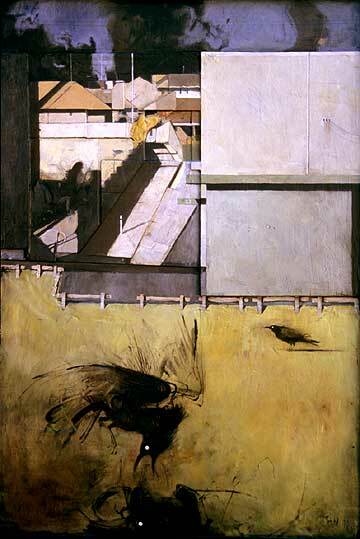 ‘Fighting Crows’ 1998, oils, wood, cardboard, plaster on plywood, 50 x 70cm. 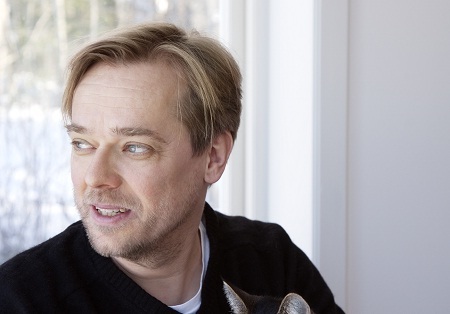 Mats Kempe, librarian, author and new member of the Astrid Lindgren Memorial Award jury took the time to answer some questions from the award office during his summer holiday in Sundsvall. Tell us a little about yourself. Who is Mats Kempe? I feel a lot like an intermediary. I started out in adult education, first as a student and later as a teacher. I’ve always thought it was great fun to discover new things and then be able to share them, and I’ve enjoyed the intermediary roles I’ve had, such as teacher, librarian, author and critic. A keen sense of curiosity when it comes to new books and authors is what drives me. You work at Världsbiblioteket, the World Library, and have many years’ experience of reading promoting work in an international context. In what way do you find that books from different countries enrich the reader? Above all, I think people discover great new literature by broadening their perspective. In my case, for instance, Asian and African literature have provided some of my finest reading experiences in recent years. There are lots of interesting books that don’t get to us in Sweden, or that may have been translated but don’t reach potential readers. I think the book market often focuses a little too hard on domestic and Anglo-Saxon literature, especially when it comes to marketing. As a librarian, I know that readers are curious about literature from all parts of the world. I get the sense that even other European literature easily gets overlooked, and the works that are translated are often not presented in any kind of context, such as an author’s entire oeuvre or an international literary trend. Sometimes it’s just random titles that only stay in bookstores for a short time. In libraries they eventually end up in the depository or are disposed of. Often these are really good books – they’re seldom disappointing. But on the positive side, I get the feeling this situation is changing. Another good thing is discovering different narrative techniques, different literary traditions and trends, which as an author I find really stimulating. I’m constantly getting new ideas and impulses from world literature. A text needs a dynamic of some kind, it has to examine something, write about something beyond what readers already know. For me, the narrator’s tone is important too – the narrator should be someone I enjoy hanging out with while I’m reading the book. Once I’ve found a narrative tone I like, I’ll go on to read all that author’s books – even if not all of them are brilliant. And it becomes a sort of conversation, where it’s more important to follow the author’s writing process than the individual books. So, for me, a good book is a text with a dynamic – an examination that seeks out new literary territory – and with something in the narrative tone that makes me want to keep reading. What’s also important in children’s and young adult literature is the relationship between text and pictures. When you add pictures, it creates a whole new dynamic in the text. I absolutely love picture books, and I’m always making new discoveries. I’m excited by the idea that adult fiction could include more pictures, just like children’s and young adult fiction. How do you feel about your new role as a jury member for the world’s biggest prize for children’s and young adult literature? It’s going to be fantastic! The best thing about it is the opportunity to get a broader perspective on world literature. Making new discoveries and sharing them will be so exciting. I’m looking forward to playing my part in choosing new award recipients whose works can become better known around the world. I also hope to help raise the international profile of the award and its recipients. What will you be reading in your hammock this summer? Per Nilsson’s Baklängeslivet (“Life Backwards”), but of course I’ll also be browsing through some of the candidates on this year’s nomination list. More information about Mats Kempe here. 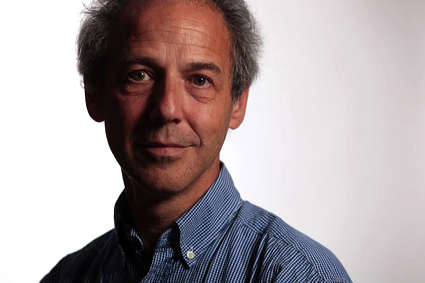 Chief and associate professor of paediatrics, Henry Ascher, took the position as new member of the Astrid Lindgren Memorial Award jury on July 1st. Tell us a little about yourself. Who is Henry Ascher? I’m a paediatrician who does a lot of work relating to the health and rights of refugee children, and indeed to the rights of all children. Over the years, I’ve come to realize that health involves much more than conventional medical care. For instance, culture and literature are crucial to human health. You’ve received multiple awards for your commitment to and work in the field of children’s rights and human rights. What is it that drives you? A sense of justice. It’s really about resisting oppression and injustice, about not imposing ourselves on others, not subordinating other people. This may have something to do with my family background. My parents arrived in Sweden before the Second World War as refugees fleeing the Nazis. My father lost his entire family. Throughout my life, I’ve always recalled my maternal grandparents’ concept of justice and their belief that the lessons to be learned from the horrors of Nazism are universal. We must work to create the conditions in which all of humanity can thrive and prevent such atrocities from ever happening again. My encounters with children, especially those living in difficult circumstances. As a fellow human, you can achieve a lot by giving children support and affirmation. Through small efforts, you can accomplish many things of great importance to children. Take the example of child refugees, who are often viewed either as helpless victims or as really strong individuals. We have to realize that the two are not mutually exclusive – that children can be both at the same time.